Recipient of the 1923 Nobel Prize in Literature, Yeats is one of history’s most influential and inspirational poets. Yeats was a driving force behind the Irish Literary Renaissance, the voice of a generation, and a central figure of great influence in 20th century literature. To commemorate the 150th anniversary of his birth, we take a brief look at his life and works. William Butler Yeats was born on the 13th July, 1865, in Sandymount, a suburb of Dublin, and spent most of his childhood splitting his time between Sandymount and London (he was educated in both places). He studied much poetry as a child and became fascinated by Irish legends, mysticism, and the occult, interests that would influence his literary output (though they featured more heavily in the earlier phases of his work). His first collection of poems, The Wandering of Oisin and Other Poems, was published in 1889, and from there he established a name for himself as a poet, though he condemned much of his earlier work later in life. He became synonymous with the renewed interest in Gaelic lore and the rise of Irish nationalism that was characteristic of the Irish Literary Revival (or the ‘Celtic Twilight,’ as it is also known). His contribution to the Revival was so great that, upon being awarded the Nobel Prize for Literature in 1923, the Nobel Committee described his work as ‘inspired poetry, which in a highly artistic form, gives expression to the spirit of a whole nation.’ Despite the honour bestowed upon him, it is often suggested that most of his greatest work, including The Tower (1928) and The Winding Stair and Other Poems (1929), was published afterward, demonstrating his enduring talent and the continuing beauty of his poetic expression. One of Yeats’s more notable early poems, ‘The Stolen Child’ shows the extent to which he was influenced by Gaelic mythology, as well as his abiding interest in Romantic and Pre-Raphaelite verse. Narrating elegantly the attempts of a charm of fairies to persuade a boy to come away with them, ‘The Stolen Child’ is both magical and beguiling in its dreamy intensity. The refrain of the bewitching faeries is also reminiscent of the haunting siren song from Homer’s Odyssey, and its verse has often been set to contemporary music by bands like The Waterboys. Proclaimed by the Irish Times as the most popular Irish poem, ‘The Lake Isle of Innisfree’ was critically acclaimed by its French and English audience, who praised it for its lack of conformity to poetic standards previously established by English poets. A short, 12-line poem, it expresses the narrator’s yearnings for the peace of a place ‘far from the madding crowd’ (Thomas Gray, 1751), as opposed to the chaos of the urbane environment in which he currently lives. ‘The Lake Isle of Innisfree’ is both an eloquent elegy to and a celebration of the bliss that tranquillity can afford. ‘The Song of Wandering Aengus’ once again draws extensively from Irish folklore, Classical Greek mythology, and occult symbolism, intertwining those influences with Yeats’s personal experiences and expressive style to create a magical hybrid of whimsical, yet sorrowful, poetry. The poem is loosely based on the legend of Aengus, the God of Love, Poetry, and Youth, and his everlasting search for his lover. However, despite the happy resolution in the myth, Yeats’s protagonist is not afforded the same happiness; not only is he unable to join his lover, he has also grown old through the fruitless years of searching, and now waits for death, hoping that it may give him the union with his lover he so craves. A unique blend of hope and resignation, ‘The Song of Wandering Aengus’ bears all the trademarks of Yeats’s evocative verse. 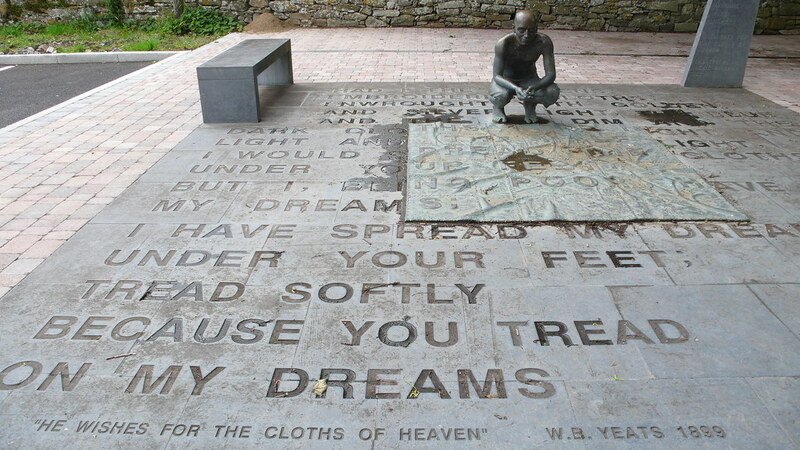 One of Yeats’s most famous poems, ‘He Wishes For The Clothes of Heaven’ is a passionate confession of devotion that has inspired generations of readers. The speaker of the poem is Aedh, who recurs frequently in Yeats’s poetry, and who, along with Michael Robartes and Red Hanrahan, is one-third of Yeats’s collective ‘Principles of the Mind.’ Aedh represents the lovelorn hero hopelessly enthralled by ‘la belle dame sans merci,’ the archetypal female, who shows little regard for him or his devotion. Eloquent in the expression of yearning and thankless passion, the poem itself has become such a powerful literary symbol that it has been quoted repeatedly in a surprising range of media, from the film Equilibrium (2002) to the song ‘Delilah,’ by The Cranberries. Written between May and September 1916, in the aftermath of the catastrophic fall-out of the Easter Uprising (Monday 24th April 1916), ‘Easter 1916’ expresses, with painfully raw emotion, the conflicting feeling Yeats felt. Yeats himself was a committed nationalist, and much admired the figureheads of the movement; however, he was keen to avoid the use of violence, which often led to tensions between himself and those who disagreed. ‘Easter 1916’ reflects all of this conflicting emotion: his zeal for independence, his distaste of violence, his regret regarding the catastrophe, and even his admiration for those who died for the cause. The power and passion with which he writes makes ‘Easter 1916’ compulsory reading. Considered to be a major work of modernist poetry, ‘The Second Coming’ marks Yeats’s transition into his final phase of poetic expression. Though he had always been profoundly influenced by mysticism and spiritualism, the tropes of cyclical existence, mortality, and legacy were especially exemplified in such instances of his later work. Using Christian imagery regarding the Apocalypse and Second Coming as an allegory for the atmosphere of post-war Europe, the poem has had such a profound influence on 20th century art, literature, and music that quotes from it, such as ‘Things fall apart; the centre cannot hold’ and ‘The ceremony of innocence is drowned’ were used by Chinua Achebe and Benjamin Britten respectively.